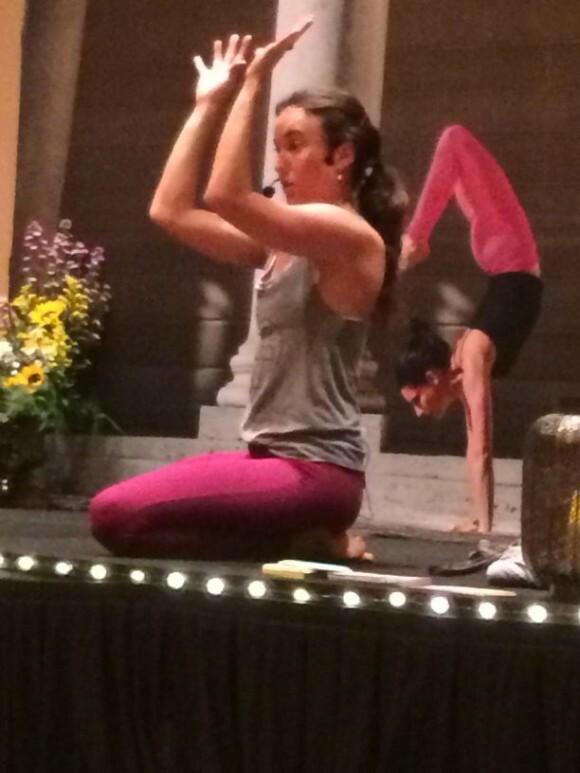 I headed off to the Yoga Journal conference in November with a niggling doubt. It had taken many months of hard work to save for, many months of planning. I was just a humble yoga teacher from Ireland, what was I thinking heading thousands of miles to a conference with world renowned teachers in an amazing venue? I don’t deserve this… I’m not worthy! I came back from the conference a different person… oh yes I am! The first thing that struck me about everyone and everything that was put out at the conference was how normal and familiar it all was, it all felt right. The common thread was a love of yoga and most of us attending were teachers, there to experience as much yoga as possible and to learn how to better share our love of yoga with our students. The numbers can be a little intimidating, 36 stories in the hotel, 1,100 attendees (New York has 2,000), 5 days full of workshops and classes, 40 different teachers, close to 100 potential classes to choose from spread over three floors of the hotel and the adjoining conference centre. We had maps and schedules and plenty of Yoga Journal crew on hand to help. Your day could potentially begin at 7am with a beachside morning meditation and go on into the evening with free special events all focused on fun and community. Choosing the workshops is a very difficult process. I choose two teachers I had studied with before and regularly take classes with on Yogaglo, Jason Crandell and Tiffany Cruikshank. The material was very familiar to me, they are both very considered teachers with a huge emphasis on safe alignment and slow, steady progression in a mindful practice and they did not disappoint. Like many of the other more popular teachers these workshops took place in huge packed rooms, taped floors so mats were all neatly lined up. I choose two other teachers I had read about or heard about. Cyndi Lee took us deeper into our practice in a way that encouraged us to meet each moment fully. Her workshop, ‘Embodied Equanimity’ was a journey of self-discovery played out in classic Hatha Yoga poses with thoughtful transitions. Rodney Yee and Colleen Saidman Yee led us though a one-day yoga retreat encouraging skillfull observation. The progression of poses was carefully planned, taking us on a journey through the body using the breath. Alignment cues between various teachers conflicted… Never ever hug knee to chest straight after wheel versus come down from wheel and hug knees to chest! Don’t take your knee further than your range of motion in tree vs. take your knee as wide as you can do in tree! This just added to the flavour and complexities of experiencing and teaching yoga. Cyndi wisely told us to write stuff down, practice it, feel it and then decide if it suits you. . If and only if it does, pass it on to your students. Rodney encouraged us not to memorise instructions but to feel them and then teach what you have felt. I choose two workshops just because they sounded like fun and they were. They were in smaller rooms, a class of just 20/30 versus hundreds in the larger workshops. Vinnie Marino took us through a challenging level 2/3 vinyasa flow. He encouraged us to be vibrant, to move and sweat and try difficult asana and to wobble and fall over and to have fun. He was also thoughtful about alignment and took pauses in the practice to slow us down and be more considered in our actions. Kiersten Mooney started her workshop, The Wow Factor, with a philosophical discussion on the power of Meditation, Prayer and Affirmations and then took us through a powerful flow embodying that theme. I did a community class of partner yoga which was amazingly strong and ended with us all on the floor in a pile literally crying laughing. Thoughtful language was a theme that prevailed. Be soft, open and compassionate. Let your bones sink into the water of your back body (savanasa). As your collarbones widen they should float. In child’s pose turn the volume down. Dual quality of effort and surrender. Thoughtful use of music was another theme, complete silence at times (pretend a sleeping baby is on your mat) to dynamic, harmonious instrumentals linked to a vibrant flow. Classic hatha yoga done safely and well was a theme for all. Mr. Iyengar was frequently quoted, the sutras of Patanjali, the nervous system, mindfulness, the breath. There was very little about advanced asana, often offered as options but never pushed, very little pressure to try to make any particular shape, very little ego. Simple, classic yoga done with full presence. The conference itself could not have been better organised and everything ran with such ease. There were healthy lunches, plenty of drinking water everywhere and yoga journal crew always on hand. The marketplace was heaven, food, jewellery, books, supplies and yoga clothing… yoga pants of every colour, print and fabric you could imagine. Yoga pants made from recycled plastic, yoga pants made from organic cotton. Most of the suppliers were small, ethical businesses using well sourced materials and all passionate about their products. Yoga Journal Live are passionate about their own ethics. They always use local teachers as well as the world renowned teachers. Each conference has free community classes open to all. A reduced rate on the conference is available if you volunteer some of your time to be crew at the event and scholarship programs are available. They often have participants travelling from Ireland. Attending the conference is more accessible than you would think but it does require a lot of advance planning. Once you have booked you have access to a community chat room to discuss sharing accommodation and transport. Working part time at the conference is an option to keep costs down. If you are even slightly intrigued I would encourage you to open your mind to it and plant a little seed. There is so much there for you to explore, practice and connect with, so much for you to wake up to and experience. One of his students asked Buddha, “Are you the messiah?” No answered Buddha. “Then are you a healer?” No, Buddha replied. “Then are you a teacher?” the student persisted. “No, I am not a teacher.” “Then what are you?” replied the student, exasperated. “I am awake” Buddha replied.